How about environmental volunteering? It’s good for the planet and great for the soul. 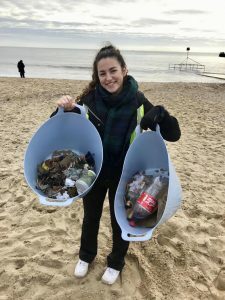 Bournemouth student, Jess, explains how she set up a beach clean club to transform the seafront as well as her social life! In a population of 7.7 billion, we could achieve so much by working together and doing a little bit. 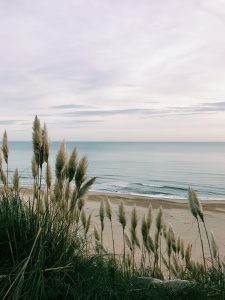 Why did you decide to set up a beach clean in Bournemouth? 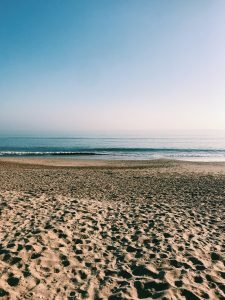 Recent surveys show that Bournemouth has been voted the best UK beach due to its panoramic bay, clean sand and adventure-packed pier. Just being along the beach makes you feel as though you have escaped somewhere exotic, yet you still have the cosmopolitan feel with the town centre being just a short walk away. Because of this, the beach can be very popular at times for socialising with friends, cooking up a storm with a disposable BBQ or having a few drinks. Whilst these social occasions are great, especially when it’s sunny, it does result in lots of litter being left behind on the beach, which eventually makes its way into the ocean, damaging the environment and many ecosystems. According to a Greenpeace report, of the 260 million tons of plastic that the world produces each year, 10% ends up in the ocean. These figures are terrifying, and they highlight that so much needs to happen amongst communities across the world to stop this! 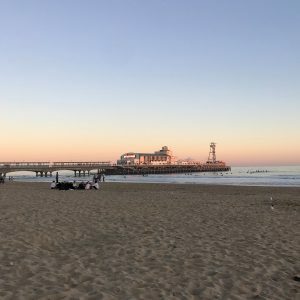 I chose to set up a beach clean club because there wasn’t anything like this already going on in Bournemouth, and I wanted to use the occasion of doing something good for the environment as a way of making friends; I pitched it as ‘making friends whilst making a difference’. At university, it can be hard to find social occasions that aren’t completely focused around drinking and clubbing, so this is a great alternative for students who aren’t into the ‘typical student life’. Following the beach cleans, I suggested for all those who were involved to head to a local independent coffee shop to warm up, especially in the winter months – so we are supporting smaller local businesses, as well as socialising together with like-minded individuals. How did you go about finding people who were interested? Initially, I didn’t think that many people would sign up as I created the beach clean club 6 months into the uni academic year, meaning all the clubs and societies fairs had already passed, and it was too late to advertise directly through the uni. I started by creating a Facebook page where people could sign up, followed by an Instagram account to post pictures of each clean. Within the space of a week, the Facebook page went from having 5 members (all of which were loyal friends and family members! ), to nearly 150 people. At first, this was a little overwhelming, because I had to approve every new member’s application, as well as respond to a sudden influx of questions regarding the first clean and what was involved. However, it was a great feeling as it highlighted how many people wanted to get involved, and I felt like I had organised the potential for great change! What do you do on a beach clean? The first beach clean involved meeting at Bournemouth Pier, however the location changed each week, depending on which part of the beach we were tackling. I brought along two large plastic buckets to collect recyclables in one, and litter in the other. This was an idea to save on single-use plastic, by not using bin liners. On the Facebook page, I suggested that everyone bring along thick gloves, or litter picking gloves, to protect their hands from any nasty sharp objects! When everyone arrived, there would be an ice breaker where I encouraged them to introduce themselves and share at least one interesting fact, to make us all feel more comfortable and at ease. Some individuals chose to spend the time listening to music with their headphones, or just completing a small section of the beach by themselves; so it is suitable for people who want some alone time, as well as those who are keen to make new friends. After an hour of litter picking and socialising, we would then divide the rubbish between the large commercial bins on the seafront, and head to my favourite coffee shop – South Coast Roast Café. 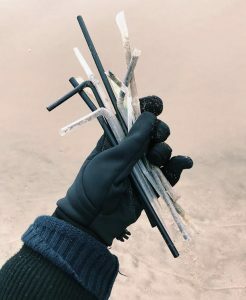 The most common culprits were definitely cigarette butts and plastic straws! In the space of 1 hour, we picked up 98 cigarette butts, which we assumed were being dropped on to the sand from Bournemouth Pier above. The experience was an eye-opener for all involved and really made us realise the impact single-use plastic can have on the environment, and how easy it is to make a difference by bringing your own straws, cutlery and coffee cups wherever you go. 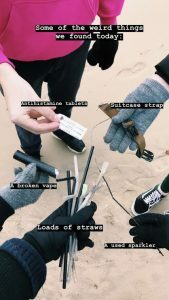 To make things more interesting, everyone had to choose the most random things they found on the beach clean: items included suitcase straps, broken vapes and sparklers! Will you be doing it again? How do people find out/get involved? 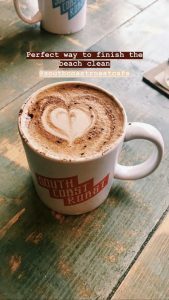 The beach clean will be running all year round and is in the process of being passed over to South Coast Roast Café, because I will soon be graduating (hopefully!) and leaving Bournemouth. The best way to get involved is to follow our Facebook and Instagram pages as information regarding future cleans will be posted there. 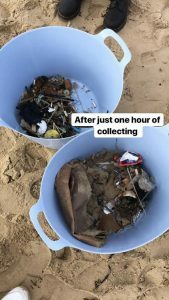 Other initiatives such as the 2 Minute Beach Clean and the 5 Minute Beach Clean Up are both Instagram accounts that encourage individuals to get involved. This has created an amazing and expansive online community and is recognised internationally, with influencers such as Zanna Van Dijk tagging the accounts from places such as Bali and Thailand. Our view is ‘if you see it, pick it up’, and has led to us collecting rubbish whilst on seafront runs, or beach walks in the evening. Adopting this attitude and following the simple Instagram challenges makes you feel like you are truly making a difference and tackling a large-scale problem. This has been further highlighted with the recent trend of ‘TrashTag’, a viral photo fad that is making the world a cleaner place, and encouraging communities to share their success in making a difference! Bare Vida are on a mission to help end single-use plastic. 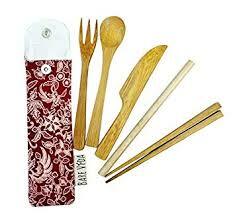 They sell high quality, reusable bamboo cutlery sets, and are offering 15% discount to HelloGrads subscribers. Click here to subscribe to HelloGrads and get the Bare Vida offer. Watch our interview with Bare Vida’s founder here.